Summary of Intel ultramobile processor ranges. Intel Atom X3 (SoFIA) – with integrated cellular modem and voice support for phones and phablets. Android and Windows Mobile. The slide below shows what Intel’s 2-in-1 PC designers call the ‘sweet spot.’ Core-M is indeed a very important class for ultramobile PCs as it represents the leading edge of laptop processors as they come down into sub 2 lb territory, sub 10-inch territory. The Intel Atom X3 series of processors is aimed at the entry-level / value smartphone market. Airmont processors (as seen in the latest Atom X5 and X7) sit alongside ARM Mali graphics and Intel’s 3G and LTE modems. Smartphones at this level could be interesting if they supported video output for Continuum-optimised Windows Store applications but they don’t. 720p Miracast is the limit here which means that they’re of very little interest to us as ultramobile PCs. 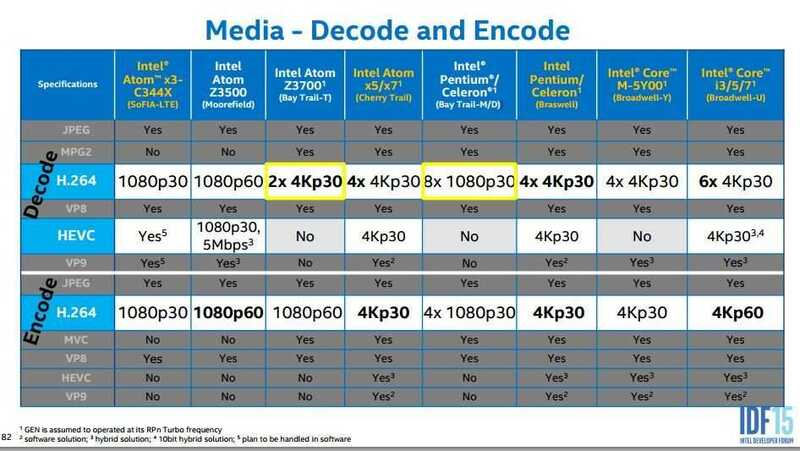 Here’s Intel’s Atom X3 overview slide. The Intel Atom X5 and X7 processors use the same basic design but are divided into low and high-end performance and feature sets with the X7 supporting 4K video output and higher GPU and CPU clocks. They can all pair with an Intel discreet modem for data-focused cellular operation, all use an eMMC 4.5 storage interface (max 200 MB/s. No SATA support) and use ‘Gen 8’ graphics. These 2 W SDP processors have CPU processing power in line with (clock-for-clock) the Z3000-series but the Gen 8 graphics is much improved. HEVC decode support, WiGig support and up to 8GB of RAM is supported in some of the models. All support USB 3.0. For more video characteristics, see the video comparison section below. 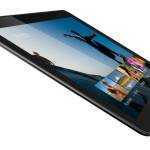 Expect to see this in most 8 – 10 inch tablets (Android and Windows) and 10-inch 2-in-1 products (Windows.) You might find X5 and X7 getting into compact mini PCs and PC ‘sticks’ too. 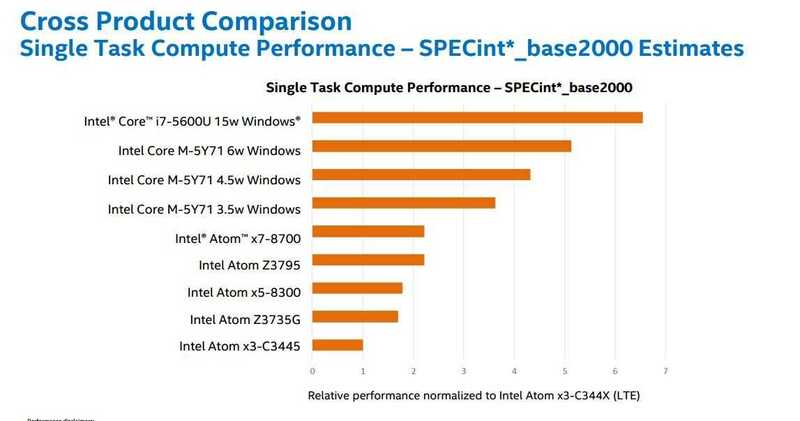 Here’s Intel’s Atom X5 / X7 overview slide. Intel Core M is a highly clock-controlled ‘Y-series’ version of the Core processors found in Ultrabooks and tablets like the Surface Pro 3. Performance can range from below Intel Atom X7 to above Core i3 but it all depends on product design and specifically, thermal design. Core M should become the standard processor for fanless, desktop-capable tablets at 10-inches and 2-in-1 devices at 11.6 – 13.3 inches. Performance can vary wildly in this category too because even the high-end Core M processors can be affected by bad thermal design. Reading independent reviews and test results is the only way to know how a Core M-based product will perform. 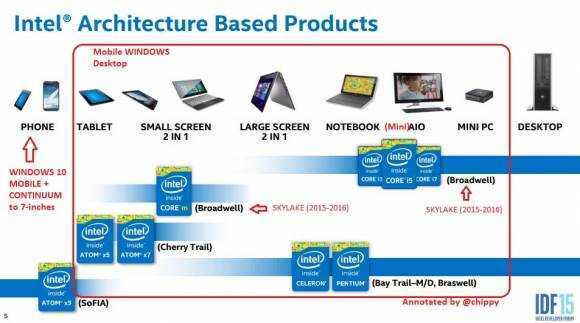 Core M is expected to transition from Broadwell architecture to Skylake architecture over the next 6 months but Intel hasn’t released official details yet. We can assume that many of the features mentioned in this article will make it into Core M for 2016 including a Gen-9 GPU, HEVC encoding, an image signal processor, RealSense camera support and SpeedShift technology. The upgrade should be a significant one. Braswell covers the same ground as the outgoing Baytrail-M CPU which was used for entry-level laptop and mini desktop systems. It runs the same CPU core as Atom X5 and X7 but offers more interface flexibility and less in terms of power efficiency. Both SATA and eMMC 4.5 storage types are supported making the choice of a laptop a little harder as performance can vary a lot. In high-end designs the Windows 10 desktop experience should be fluid enough for basic office, content creation and entertainment scenarios but this is not a ‘PC gaming’ platform. Focus on Windows Store games for gaming entertainment. Core i3 i5 and i7 processors cover all laptop scenarios up to desktop-and PC-gaming capable laptops but in the ultramobile sector we’re limited to the U-series SoC variants which can go into thin, mostly sealed-battery designs of 12-inch and above. The Surface Pro 3 is an example of what best-practice engineering can achieve – desktop capability in an 800 gram / 1.8 pound tablet. Integrated graphics support goes up to Intel Iris and there are models that support VPro for business applications. Up to 16 GB of RAM is supported and up to 4 SATA 6GB/s storage channels offer high-end SSD possibilities. Two weeks after this article is published (September 2015) the current Broadwell architecture will be old-generation as Skylake is launched but we have details on that already. 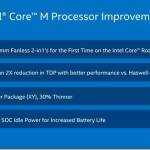 Read this article for some of the advanced features that will be available to the new Core M, i3, i5 and i7 processors. As always you can expect many months of transition as new products get launched. We should see the first launching at IFA in September with a larger range during Q4 and peaking for CES in January 2016. The highlight could be a Surface Pro 4 launch which is sill unconfirmed but widely expected in October. At that point we should see a flagship Skylake-based product and a good reference point for what will be possible during 2016. Windows 10 DIAL, DLNA and Miracast ‘casting’ improvements. Windows 10 Modern Standby features. Windows 10 Pen and Stylus improvements. A few years ago Intel decided to introduce the Scenario Design Power (SDP) measurement which was targeted at system design engineers. It’s a figure that can be used by engineers to quickly determine what sort of device the processor will fit into and what thermal considerations need to be made. For example, a smartphone is a 2W scenario. A 10-inch fanless tablet is capable of supporting a 4W scenario. 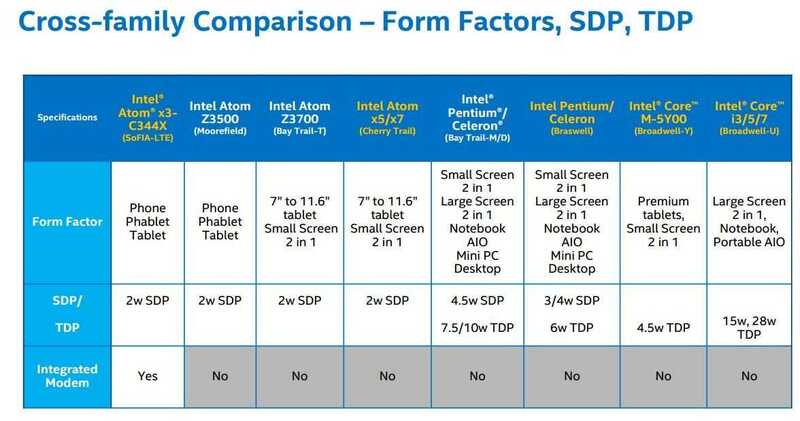 It’s still confusing though because Intel often publishes TDP figures too. Ignore all that now and look at the slide below. 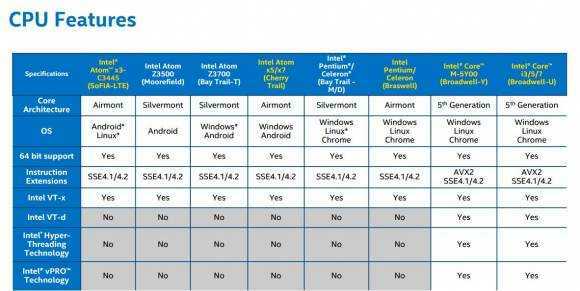 This list of form-factors aligns with Intel mobile processors showing clearly that Atom X3 is for phones, that for small-screen tablets the Atom X5 and X7 should be used and if you’re going for a premium tablet then Core M is the processor to be used. There are some performance overlaps, especially with Core M, but what’s not published here is the target retail price which also separates the processor product ranges. Consumer Core M tablets will occupy the $400 – $500 space while consumer Ultrabooks with Core i3 won’t come down below $500. A consumer 2-in-1 with X7 should reach up to $400 with 8-inch tablets at the $100- $250 mark. Naturally ‘pro’ or ‘business’ versions of these products work in a higher price range, over time the average prices will drop and there will be a few exceptions but be aware that each mobile processor has its place in the pricing structure. Mobile processor scenarios and form-factors. A CPU isn’t just about raw processing. It has to support a range of subsystems and I/O interfaces that also affect system performance and capabilities. 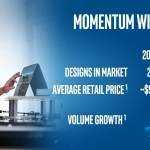 Intel’s mobile processor range is tailored to offer features that match the form-factors and scenarios above. Is anyone interested in VPro on phone? What tablet user needs DisplayPort and virtualization? A PCI bus on an Android phablet? The slide below is a good summary of the core CPU features. Memory and graphics are covered in slides below. Intel haven’t published a slide for I/O and sensor support but you’ll find that in the per-processor slides at the start of this article. Also included in the slide is the target Operating System. Linux, Android, Windows and Chrome are supported. OS X is not shown but it’s supported from Core M up (and in theory, X5 and X7 would support it but Apple have their own processor and OS solution for that class of devices.) Note that all processors use a 64-bit architecture and support 64-bit operating systems although there are some Z3000-series products that required a 32-bit Windows and Linux build (due to a UEFI limitation that ended up being baked into the processor, apparently.) For businesses needing remote control and extended security features VPro variants appear in all Core processor ranges. Single-task benchmarking doesn’t match real-world usage but the slide that Intel provide here is a good look at how the CPU performance characteristics compare across the ultramobile segment. Note that CPU Turbo Boost is likely to be included in these figures and these are highly dependant on thermal design. There are ‘TDP-down’ options in some Core processors too. Designers can use these features to reduce performance (to save battery life and reduce heat) if needed. 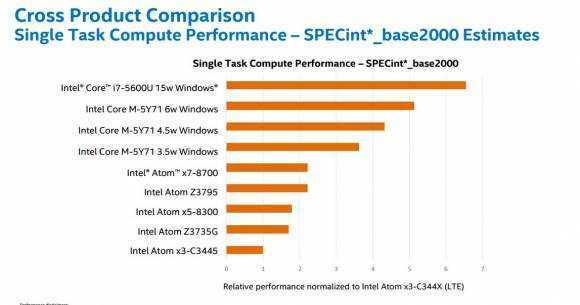 Note that the high-end Atom X7 CPU performance is no different to the high-end Z3795 which is not surprising as there were no major CPU architecture changes from 22nm Silvermont to 14nm Airmont. In my experience, a well-configured Atom Z3795 / Atom X7 (4GB RAM, good eMMC) is enough to support casual Windows desktop usage and low-end productivity. Below this point there are serious limits to how Windows can be used in terms of multitasking. Memory performance is defined by the technology used, the clockrate of the memory and the memory bus capacity. There are also physical considerations in how the memory is mounted on the mainboard and how much power it uses (how much heat it dissipates.) In most cases across the ultramobile PC sector we’ve seen Low Power DDR3 1.2V memory being soldered to the mainboard (AKA: Memory Down.) but there DDR3 modules can be found in laptop form factors where space is at less of a premium. Speeds of 1600 MT/s (Million transfers per second) are supported across channel sizes of up to 64-bit. With the new Skylake architecture comes the first Core processor to support DDR4 but there’s no support for LPDDR4 which means that memory performance on Memory-Down solutions for tablets and 2-in-1’s won’t get any advantage. Ultrabooks will be able to take advantage of DDR4 although the performance differences will be small. Power usage and sizing advantages could help Ultrabook designs though. With graphics, video and media support we come to one of the most complex mix of capability and the widest range of performances. The X3’s MALI architecture is nothing compared to the new Skylake architecture which can support desktop-style PC gaming but in the ultramobile space there are limits to how much of that high-end architecture can be used. Let’s start with a pure graphics comparison between the processors PC processors. This comparison does not include Skylake Gen 9 GPU architecture which is expected to have significant performance advantages over Broadwell Gen 8 graphics. Ultramobile processor graphics performance comparison. 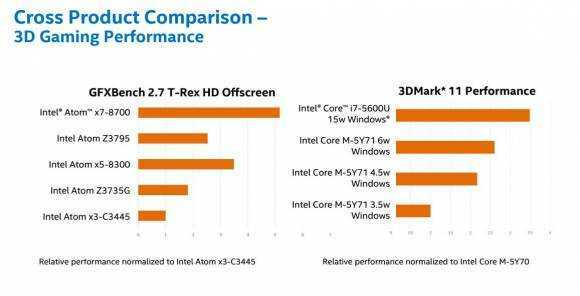 The performance comparisons are split between two benchmarks here but for comparison you can expect Intel Atom X7-8700 to have about 40% less 3DMark 11 performance than the low-end Core-M (Broadwell.) 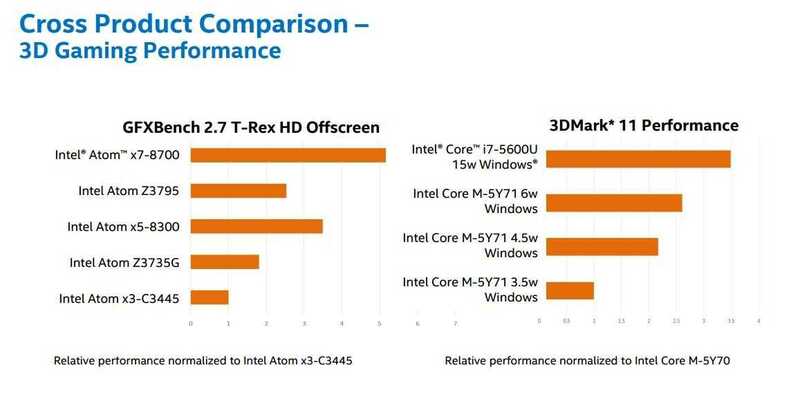 That gap will widen with Skylake architecture Core M products. Note the big difference between the Baytrail-T and X5 / X7 tablet-targeted processors where the GPU was upgraded from Gen 7 to Gen 8. Video playback, video encoding, image processing and audio processing are important media features and here we also see big differences in the range of offerings. The new Skylake architecture will introduce an image signal processor and a real-time video encoding engine targeted at video conferencing. The audio signal processor seen in Core M and the Broadwell-U Core series is also included. All of the solutions include full-HD hardware decode and encode. Hardware supported 4K playback is available in Baytrail-T, X5 and X7 and all Core solutions but only at 60 fps. 4K HEVC decode support is not available on the current Core M generation but is supported on some other platforms. For those interested in HEVC encoding (compressing video files, rendering home videos) then you’re out of luck as there’s no hardware support. 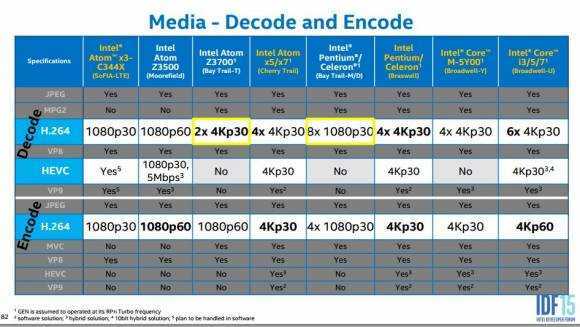 That’s will change with Skylake where HEVC 8-bit encoding is available in hardware. Video output / screen support. The last piece of the media chain is the video output to internal, external and wirelessly remote screens. The standards shown in the chart can be grouped as follows. MIPI + eDP are internal connectivity standards. HDMI and DisplayPort are wired external screen standards and Intel Wireless Display is a compressed a/v channel transported over WiFi. Again, 4K support is available but 60 fps is only supported with DP1.2 or with an internal DisplayPort to HDMI 2.0 adaptor. That doesn’t change with Skylake although Skylake will support bigger resolutions over WiDi. Note that Atom X3 does not have external display support so the advantages of Windows Continuum on the Universal Windows Platform are not possible. The ultramobile processor range from Intel spans from entry-level phone through phablet, tablet, 2-in-1 and ultrabook space and covers multiple operating systems. 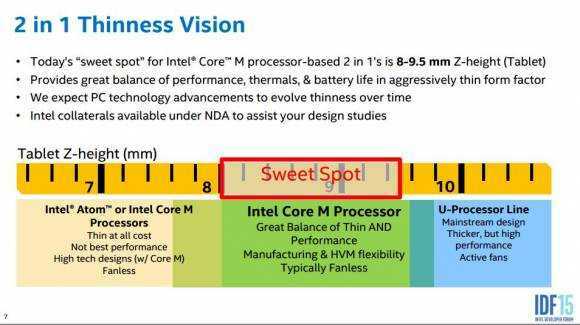 Skylake architecture is expected to bring big advantages to Ultrabooks and new Core-M based 2-in-1 products and Atom X5 and X7 offer interesting possibilities for very small Windows solutions. After 2 years on the market we will begin see Baytrail-T fade away. We expect the current Core M solution to be found in new 2-in-1 PCs going into 2016 as the transition to Skylake won’t happen overnight. 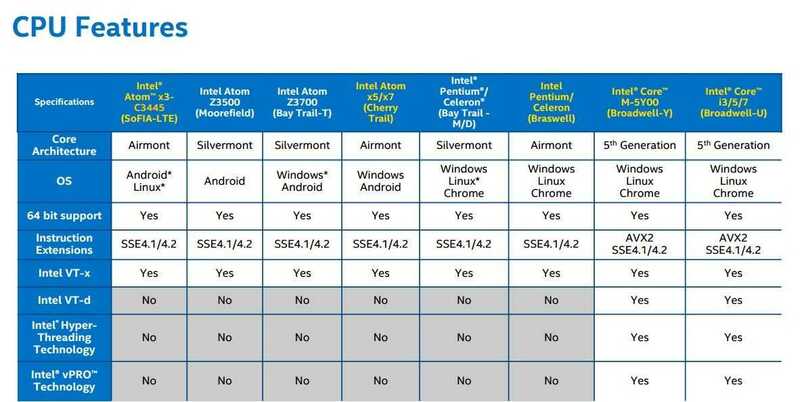 The Intel Atom X3 platform isn’t interesting to us due to display output limitations although we should expect new SKUs to appear soon which could include a high-end X3 solution including HDMI output support. We haven’t covered security features in this report as that will be covered in another report after we’re able to test Windows 10 on the Skylake platform. Note: UMPCPortal and the ultramobile PC database focuses on Ultramobile products with a minimum operating weight of 1.2 KG (2.98 pounds) or less. 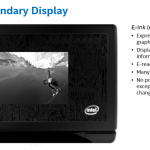 Slides via the Intel IDF Technical Session Catalogue seen on this page. Did they mention anything about a manufacturing delay for Cherry Trail tablets? There have been rumours that HP pushed their X2 10 with Bay Trail because of a delay with their manufacturer. Here’s to hoping they have a Cherry Trail update. Intel haven’t said anything about X5 /X7 delays but what’s happening in the market is, in my opinion, a good indicator that there have been delays. Windows 10 may have pushed things back though so let’s wait until IFA where i’m sure we’ll get confirmation, even if it’s just through the number of new X5 / X7 device we see. « Universal stylus standard targets 1-year battery life, vendor extensions.